Tuesday, February 5 -- We decided to leave the Lost Dutchman State Park rather than stay overnight in the overflow area. It was okay for dry camping but since we had to move anyway, we wanted to try something else. 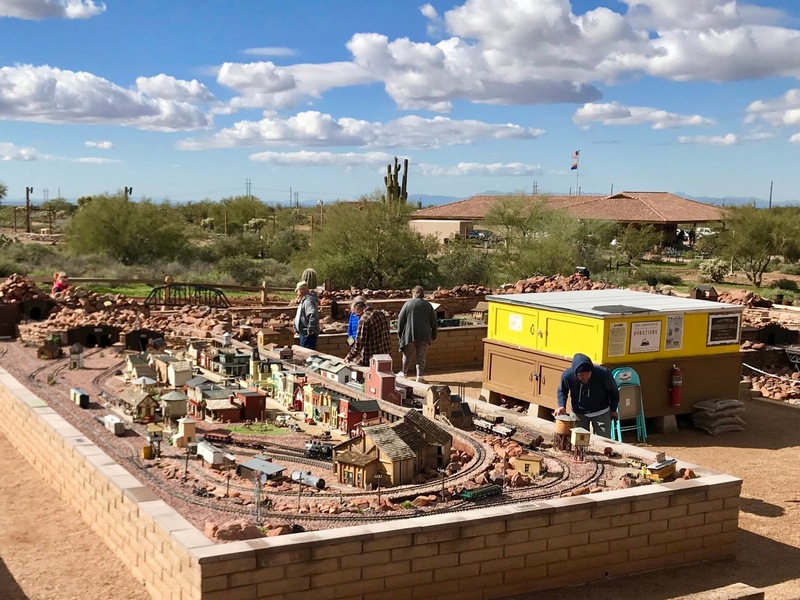 Apache Junction KOA Journey pull-through site. 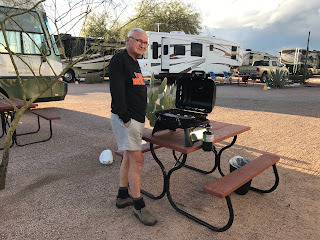 We've never stayed at a KOA so we called the Apache Junction KOA (Kampgrounds of America) Journey and got a pull through site with full hookups. In addition to RV sites, they have tent sites and small cabins for rent. While we were there Wayne set up our new BBQ from Canadian Tire in Powell River. We'll inaugurate it soon with the steak we purchased at Fry's. We warmed up our spaghetti for dinner and I used the free wifi to work on my blog entry. And of course there was writing and drawing in my journal. Wednesday, February 6 -- Last night there was a thunderstorm with pelting rain, but this morning there are puffy white clearing weather cumulus clouds. We walked next door to Linda's Hoosier Cafe. We had an excellent breakfast with great service and lots of coffee to go with it. My biscuits and gravy got a 9 on my 10 point scale. 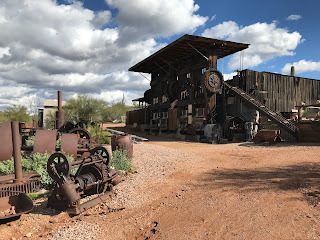 An ore crusher at the Superstition Mountain Museum. 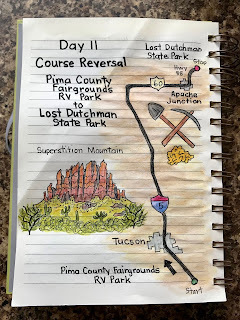 We were too early to check back into the Lost Dutchman State Park so we stopped at the Superstition Mountain Museum along the way. 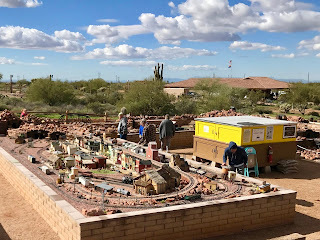 We walked through the free outdoor exhibits of old mining equipment and model trains. Danny in Powell River, this picture's for you. Danny in Powell River, this picture is for you. 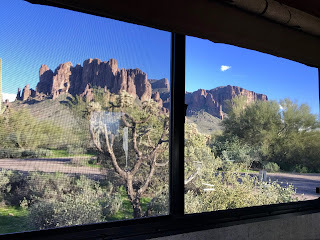 We left the museum for the Lost Dutchman State Park campground to find our new spot. This one was without services. It was our first time to dry RV camp. We were already stocked up on water, propane and gasoline. Our generator would give us electricity during the allowed morning and evening hours. 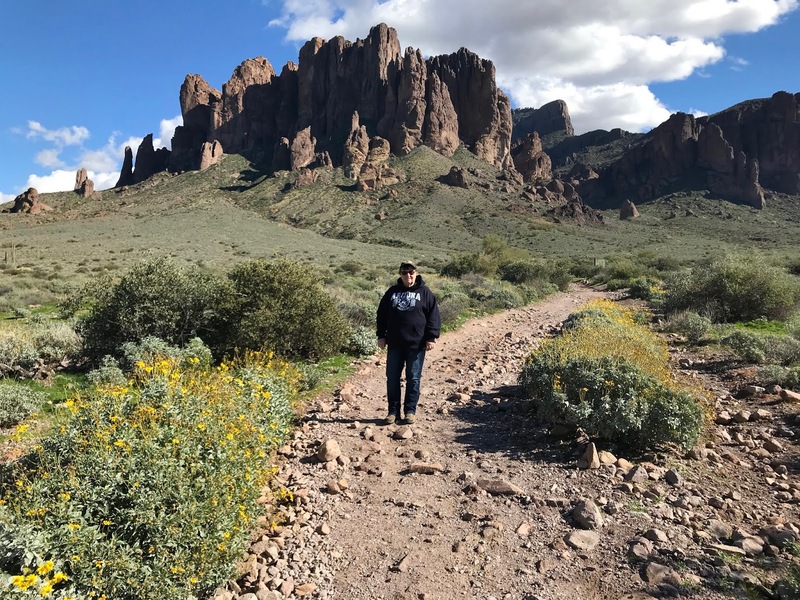 A three mile hike near the Superstition Mountains. After we got settled we took a three mile walk on the State Park's well maintained trails. The temperature was warm but not hot, perfect hiking weather. The view from our dining table. Awesome. Wayne barbecued our New York steak. I don't think I've ever had a better view for dinner. Sunset's glow on the Superstition Mountains. 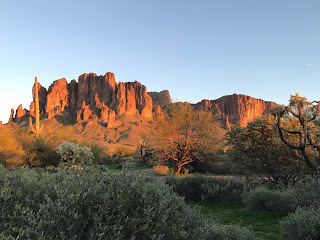 I almost missed sunset's glow on the massive cliffs. What an awesome sight. Full hookups are nice, but you can find better places to stay when you go dry camping. 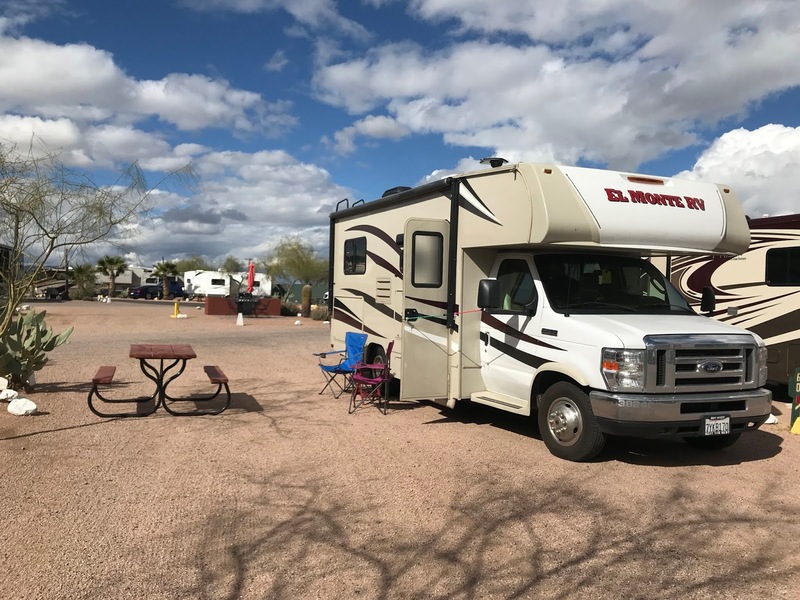 RV Levelers: Most RV parks have level sites. When you dry camp you often find ground that isn't level. 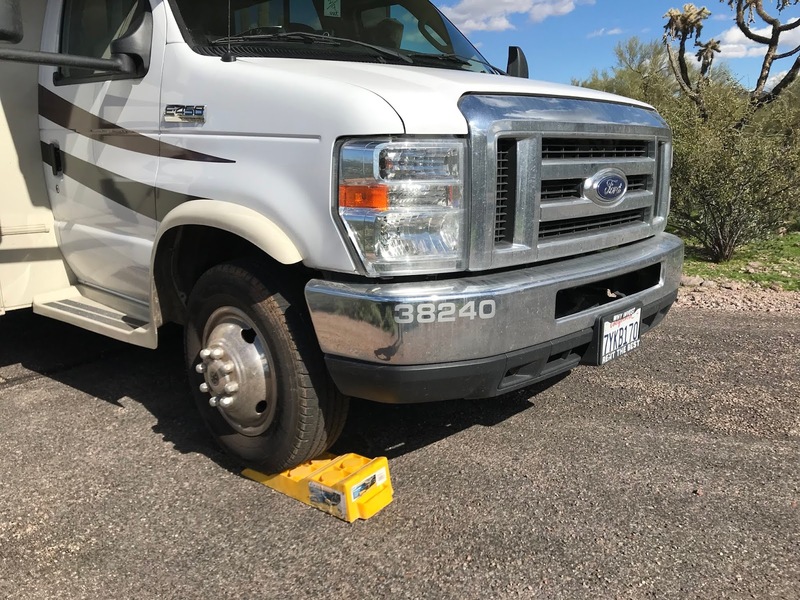 For RV appliances, you need to be as close to level as possible. It 's especially important for the refrigerator when it's running on propane. We know that from our float cabin's propane fridge. Our front wheel up on a leveler block. That's an amazing part of the country. 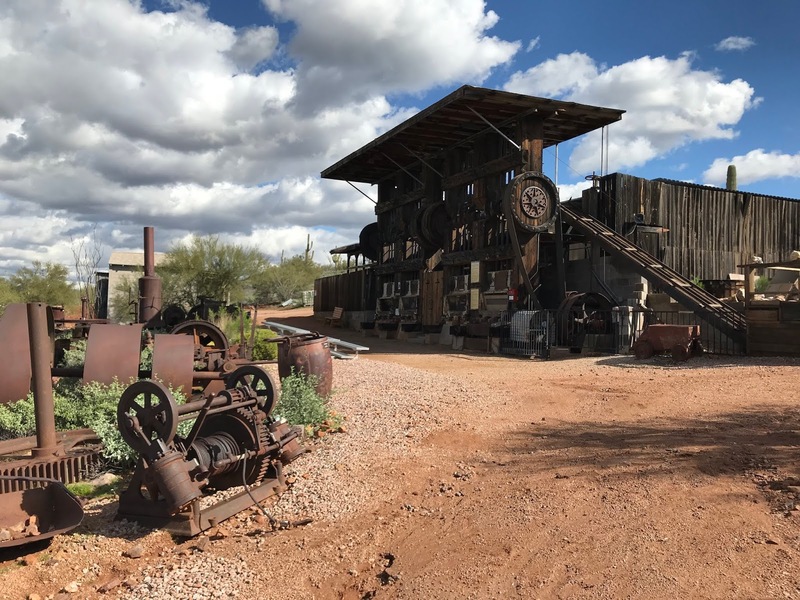 The museum looks like one unique place. I forgot you are renting it. That's amazing, the leveler thingies. With hubby's back issues, we couldn't possibly do this. I'm enjoying your trip, though!